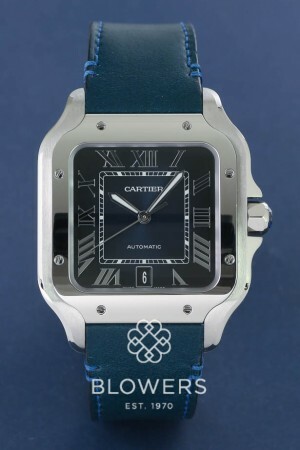 Cartier Santos WSSA0013. Brushed steel case 39.8mm. Water resistant to 100 meters. Automatic calibre 1847 MC movement. Polished steel bezel. 7-sided crown set with a faceted synthetic spinel, graduated blue dial, steel sword-shaped hands, sapphire crystal. Steel bracelet with “SmartLink” adjustment system and Blue leather strap with steel folding clasp. Pre-owned Unworn. Box and papers dated January 2019. SKU: 3012217. Categories: Cartier, Santos.